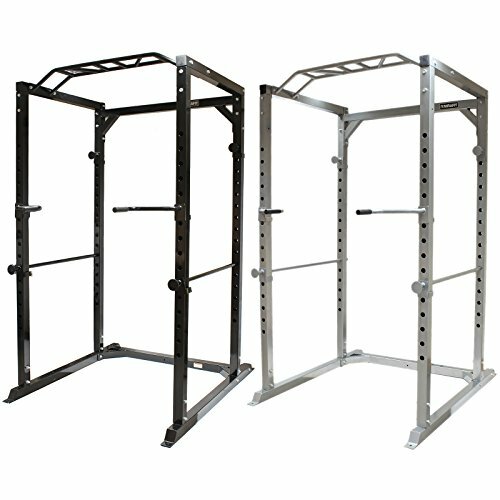 In this post I am going to be looking at the best squat rack for home gyms but I’ll also be looking at power cages too as they are often what people are looking for when kitting out their space at home with a safe weight lifting environment. What’s the difference? 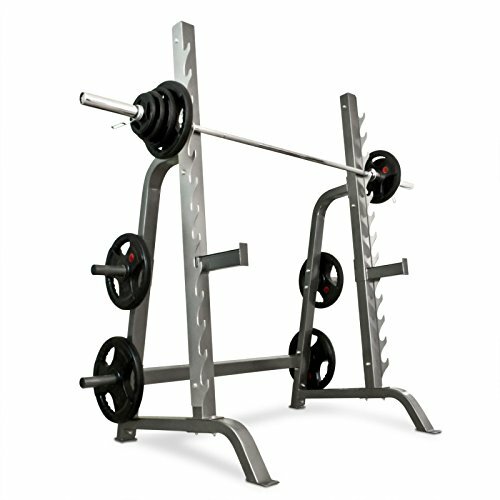 Well squat racks, or weight racks, look like this one to the side, it’s of an open construction and is basically good for a couple of type of exercises, squats and bench presses are the main ones. As the name implies it is there to support you when doing squats or presses and if you can’t complete a set you know that rack will be there to help place the weights on so you won’t drop them on yourself and causing injury. Power cages on the other hand are much bigger pieces of equipment and as you can see is a cage like structure. 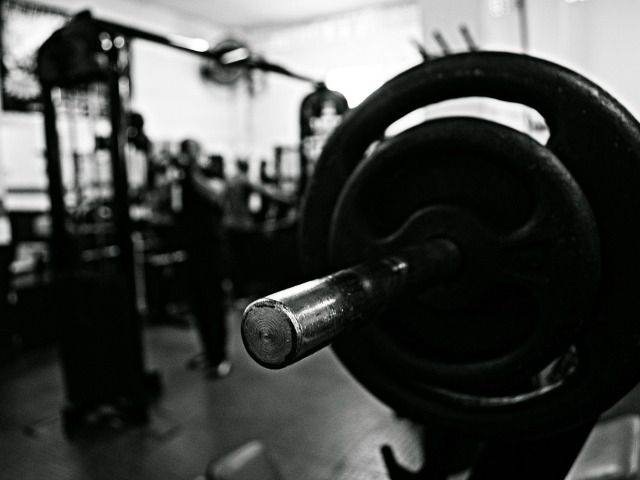 I prefer power cages because I feel that in a home gym environment, where you’re on your own, it’s a much safer option. You also have more options with a power cage which means you can safely perform a number of exercises. Power cages are also the best value in my opinion – you can generally use them for pull ups and for dips which means you need less equipment in your home gym. I like to keep my gym free of too many items so multi purpose equipment gets my vote. Scroll down to see my choices for the best power cage on the market right now. Another thing you may see, which are also cheaper, are squat stands. They hold your weights for you at your required height. Personally, they’re not my favourite bit of kit, they aren’t particularly safe if you’re training on your own, but they are a much more space saving option, as well as being cheaper, so could be worth considering if that’s a problem for you or if you train with a friend. I’ll do a post in the future about these but this post won’t be looking at them. Does it have adjustable spotter catchers? Will it fit in your available space? Check height as well! Something too big won’t make a good home squat rack. Can you do other things with it? 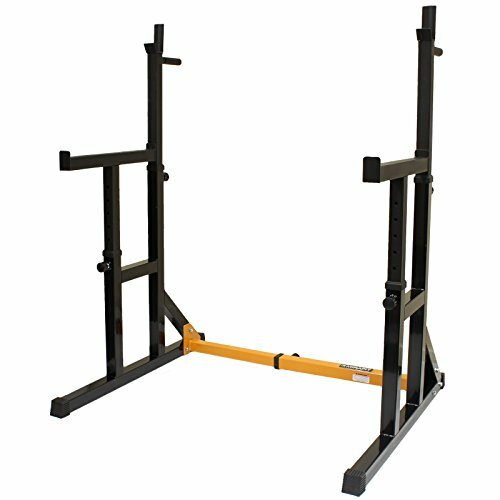 Power racks often can be used for pull ups and dips making them a good value bit of kit. 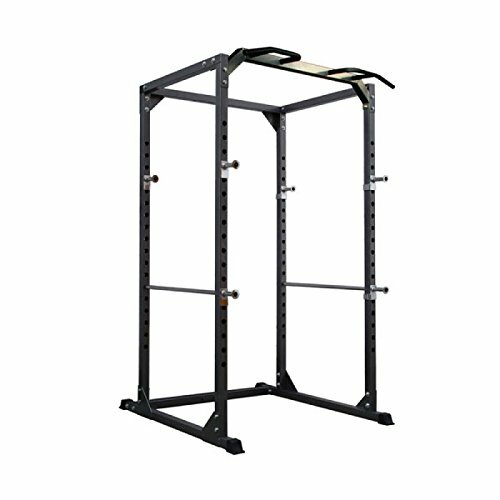 This is the cheapest option I have on this page so if you’re looking for a budget squat rack then keep reading. The MiraFit Adjustable squat rack is a great bit of kit and I am amazed at what you get for your money here. It comes with a whole host of positive reviews on Amazon (click the image to see them) and if you’re just starting out I think it’s great. It provides lots of different levels for you so you can do many different work outs and the spotter arms are there to keep you safe should you fail on one of your lifts. 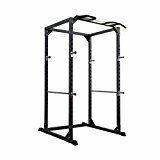 This heavy duty squat rack from BodyMax is a great option if you don’t want the full power cage option but want the strongest and safest squat rack you can get. This one looks really good and I love the style of it. But it’s also really functional and gives a good secure feeling when you’re using it. You can also store your weights on the side of it which is great for a home gym where you don’t want everything all over the place. Check out the latest price and reviews here. This is a good and solid basic power rack/cage and comes highly recommended. If you have no desire to get really big weights then this one should be absolutely adequate. What I like about this one is that there’s an option to upgrade it at a later date with a pulley attachment so you can get more exercise routines out of it. You can also get a dip attachment too should you want that. Check out more reviews on Amazon here. This is the most expensive of the options I’ve presented today, but I feel like it’s a great investment for anyone who is serious about weight lifting, wants to do it every day and won’t have anyone around while they are training. It makes a great and safe option for plenty of exercises. It’s heavy duty which means it’s up to the job. As you continue working out you’ll have more weight added to your barbells and so you’ll want something that can handle that too. This one is perfect for someone who knows that they’ll be needing it to grow with them. You can do pull ups and dips on this cage so it’s good all rounder too and makes it good value.